Is Radium Lume Really That Dangerous? Many vintage watches have radium lume on the dial and in the watch hands. It’s a big part of the overall appearance and the charm of these vintage watches. Especially when the lume has changed into that attractive vintage yellow/brown color. However, all over the internet are scary stories about radium, radioactivity, and the potential dangers. Is radium lume really that dangerous or is it a tempest in a teapot? In 1898, Pierre and Marie Curie discovered radium when they found out that the mineral uraninite was still radioactive after they’d removed the uranium. Radioactivity was new and exciting. They had no idea that it was potentially dangerous. In fact, people thought that it was healthy and it was included as an ingredient in many products. Those products even included drinks and creams. Watchmakers discovered that they could mix the radium with paint to create a paint that glows in the dark. In the early 1900s, the dials and hands of nearly all timepieces were painted with this radioluminescent paint. Almost all of the workers were women and they were told that the paint was absolutely harmless. They pointed their brushes on their lips to create a fine tip for the delicate work. Several of the women got seriously ill and sued their employer for having contracted an occupational disease. These women are known as the Radium Girls. The case was settled in 1928 and since that time, radium dial painters were provided with protective gear. Most importantly, they were forbidden to point the tip with their lips and they avoided to ingest or inhale the luminous paint. Eventually, safer options were discovered and the use of radium was discontinued in the 1960s. Radium has a half-life of 1600 years. That means that the old radium on your watch dial and in the hands doesn’t glow anymore but it’s still radioactive. It emits two types of radiation; alpha radiation and gamma radiation. 97% of the radiation is alpha radiation, also known as alpha particles. These particles have such a large mass that they can only travel for a few centimeters and they’re easily absorbed. The watch crystal and the watch case(back) absorb all the alpha particles while wearing the watch. The particles also can’t penetrate the epidermis so they’re absorbed by the skin without entering the body. Alpha particles are highly dangerous inside the body though, because it kills and mutates cells. That’s why those poor radium girls got sick. They licked their brushes with luminous paint hundreds of times a day and ingested radium every time they did so. 3% of the radiation is the penetrating gamma radiation. Unlike alpha radiation, this type of radiation won’t be stopped by paper or plastic and it also penetrates the skin. Tests have shown that a radium dial emits approx. 10uSv / hr. That means that you’ll have been exposed to a full day’s worth of background radiation in about 20 minutes. This is almost exclusively the gamma radiation because the alpha particles will have been blocked. Decasing, removing the hands and dial and vice versa shouldn’t take more than 30 minutes. That means you’ll have been exposed to approx. a day and a half worth of background radiation as a watchmaker. While that’s not perfectly safe, it’s also not an immediate cause for concern. What you might not have realized is that you’re exposed to the same level of radiation when you’re wearing the watch because gamma radiation requires a massive shield (a thick layer of lead for example) to be absorbed. You’ll actually be more exposed because you’ll likely wear a watch for more than 30 minutes at a time. So, it’s not only the watchmaker who’s affected by the gamma rays but also the wearer. The gaseous decay product of radium is radon. According to the United States Environmental Protection Agency, radon is the number one cause of lung cancer among non-smokers. In other words, it’s a serious health hazard. It also comes from natural sources and occurs as background radiation. However, radon could only pose a threat in watches that are airtight, like divers. Many of the older dress watches are barely dustproof so there’s no way that gas could have built up. If you suspect that radon might have built up over time, carefully remove the crystal in a well-ventilated room and let it cool down for a while. 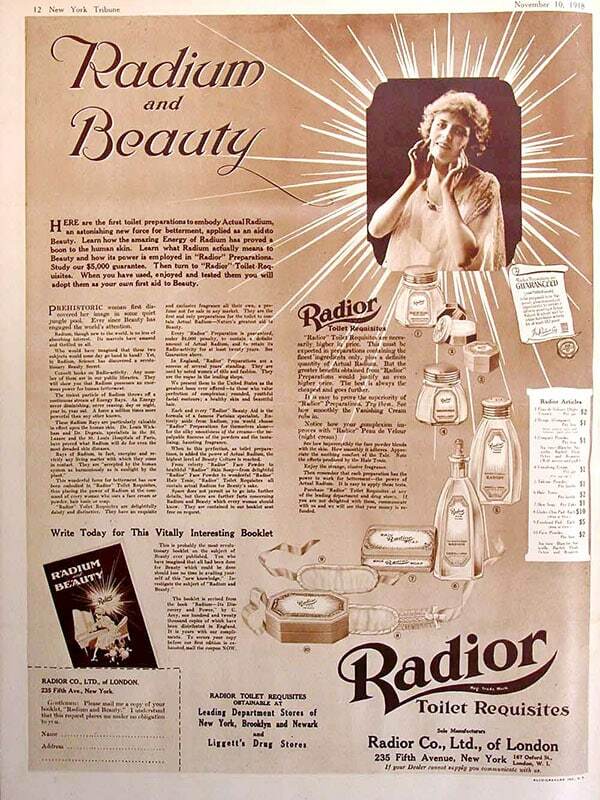 The use of radium was discontinued since the 1960s. Omega stopped using radium around 1963. Immediately after, substances like promethium and tritium were used as a luminous material and they’re still being used today. Nowadays, Super-LumiNova, which is completely non-radioactive and non-toxic, is the most used lume in watchmaking. As you can see, radium is not completely safe. That’s why the use of radium was discontinued in the 1960s. But it’s also not as dangerous as many claim it to be. Not a single factory worker got sick after they started wearing protective gear and stopped licking their paintbrush. The biggest risk is inhalation or ingestion of radium because alpha particles are harmful inside the body. Old lume has often dried out and turned brittle so that’s certainly a risk when you want to relume the hands, for example. However, if you take some precautions and use common sense, you’ll be fine. I always wear a face mask and disposable gloves or finger cots. I also open a window or the door and I wipe the working area clean with a damp cloth. What do you think of those old radium dials and hands? Let me know in the comments below. Nice article. Most people are not aware how much 10 uSv/h is. It is equivalent to a dental Xray every hour. Do you have any tips to remove the paint from dials without destroying the paint? And how do you dispose of the radium? Hi, thanks. Everybody knows what a dental Xray is so thank you for clarifying. I try to keep away from the dial as much as possible because it’s very easy to accidentally remove varnish or lettering/markings. But if I had to, I’d use a toothpick or cotton swab with some alcohol. I collect tissues and cloths with old radium in a tin and I take it to the recycling point. In 2009 I bought a 100% factory accurate fully restored 1961 (M1) Bulova Accutron Spaceview Alpha 14kt solid white gold from a reputable dealer. The luminous hands were advertised as new old stock . Do you have any experience with these watches to know if Bulova was still using Radium in 1961? It has been a concern of mine for quite some time particularly since I have to open the back of the watch to replace the battery from time to time. I guess I could buy a geiger counter but I was hoping someone might know the answer to this question. I bought a Steinhart watch one month ago (black military 42 model). It’s said to use “old radium” as lume. Do you know if it’s really made out of radium or is it a like-radium lume to make the whole more vintage? As far as I know, it uses the BGW9 SuperLuminova lume so it’s not radium. It should be whitish in daylight with a blue glow in the dark. Read the book “The Radium Girls” and learn that radium is more dangerous than this article claims. It was not only the dial painters that became ill. Even family members (in one case a sister who shared a bed with her dial painter sibling) became ill. READ THE BOOK AND LEARN THE TRUTH. AS ALWAYS, BIG BUSINESS ONLY CARES ABOUT PROFITS, NOT PEOPLE. I’ve read Kate Moore’s book. It’s not safe, that’s why it was banned. But there’s no need to get hysterical about it. There’s a way to handle it safely with the proper protective clothing and procedures.